CHELMSFORD — The air conditioner in their bedroom was broken that sweaty summer night, its steady hum replaced by silence. So when their daughter, Shea, 15, cried out about 3:45 a.m., Jeannie and Kevin McDonough heard her. They thought it was a nightmare. And in a way, they were right. What the McDonoughs faced on July 30, 2007, in a tiny bedroom crammed with two twin beds, was an encounter of unimaginable terror. When they opened the door to check on their daughter, the couple found a masked man looming over her bed, a knife in his hand. They reacted decisively and seemingly without fear, pulling the man off and holding him down until police arrived. Three years later, Jeannie McDonough, 50, has written a book about that night and its aftermath. In those adrenaline charged minutes, she says, ignorance kept her from becoming paralyzed: She did not know she was fighting a serial killer who had killed his previous victim the day before. In fact, the man who crept into her home was Adam Leroy Lane, 43, a truck driver from North Carolina who later pleaded guilty to killing Monica Massaro, 38, in New Jersey on July 29, and Darlene Ewalt, 42, in Pennsylvania on July 13. Lane, who was sentenced to life in prison for the Pennsylvania killing, also pleaded guilty to invading the McDonoughs’ home after leaving his truck at a rest stop on nearby Interstate 495. McDonough said she wrote about what had happened a few weeks later, when she found out Lane had killed Massaro. At first, she said, she wrote for herself, because it was cathartic. After her husband and a handful of others read her burgeoning journal and encouraged her, she began to think about publishing a book, one she hoped would help assuage her survivor’s guilt. “It’s a good story for us, with a happy ending, but it’s difficult because there are people who didn’t make it,’’ she says. “I felt like I wanted to give the victims a voice.’’ Her book, “Caught in the Act,’’ written with coauthor Paul Lonardo and published by the Penguin Group, will be in bookstores next week. At her small, immaculate home — the family never once considered moving, McDonough said — she recalled that night with perfect clarity. Every detail has resonance; stacked together, they strike a precarious balance, good fortune edging out bad. 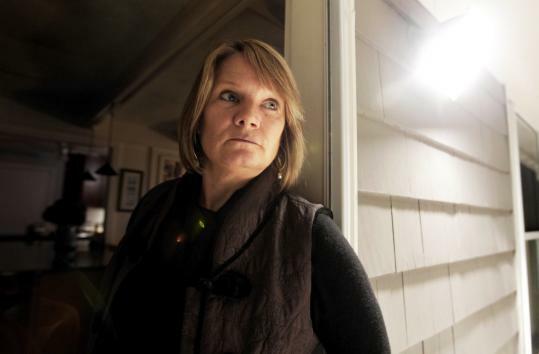 Her home was not the trucker’s first stop in Chelmsford that night. A resident of a condominium complex on Route 110 reported an attempted break-in around 11 p.m. Three hours later at a nearby mobile home park, a terrified mother and daughter told police a man dressed in black had tried to force his way into their trailer. At the McDonoughs’ home, the killer found the back door unlocked. Jeannie McDonough says her daughter left it that way when she came home that night, because she thought her brother was coming home later. In fact, he had opted to stay at a friend’s house. Because it was so hot in her upstairs bedroom, her mother says, Shea decided to sleep in the downstairs guest room, where there was an air conditioner. The small room was next door to her parents’ bedroom. The family’s dog, a Labrador retriever mix named Bosco, was outside, but never barked as Lane skirted the house. McDonough counts that as lucky; if the dog barked, she said, she would have gone outside alone to check on him and might have become the killer’s victim. Instead, the trucker entered the house, found Shea’s purse on the kitchen counter, and pulled out her student ID card. Then he walked down the hall, past Jeannie and Kevin McDonough’s open bedroom door, and into the room where Shea was asleep. One of the oddest things, McDonough says, is that when they heard their daughter’s cry, she and her husband both got up together and went to check on her. Kevin McDonough, 5-foot-9 and 160 pounds, wrestled the larger man to the floor and held him in a chokehold until police came, minutes after Shea’s 911 call. Jeannie McDonough, her hands bloody from the assailant’s knife, remembers asking Lane who he was. “I’m nobody,’’ the masked man told her.